David Thomson, who raced as co-skipper aboard Class40 Mowgli in the 2008-09 Portimão Global Ocean Race and is signed up to race the 2011-12 Global Ocean Race with Alex Alley, is currently undertaking another extraordinary high-seas adventure. On Saturday 20th March, he sailed under the Golden Gate Bridge and out of San Francisco Bay as co-skipper aboard the trans-Pacific expedition vessel Plastiki, bound for Sydney, Australia (view an image gallery of the departure here). The brainchild of banking heir and passionate eco-hero, David de Rothschild, Plastiki has been three years in the making. 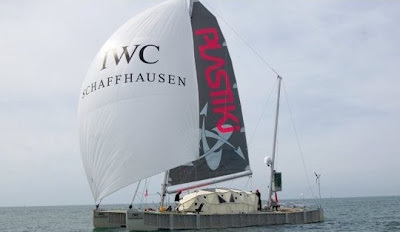 The catamaran vessel, designed by Australian naval architect Andy Dovell, is built using a material known as PT which is created purely from recycled plastic bottles and the expedition aims to raise awareness of how it is possible to use our garbage to great benefit. The voyage will also highlight the man-made horror of the Pacific Garbage Patch – vast swaths of waste that have accumulated in this beautiful and sensitive ocean. Some 12,500 plastic bottles have been used in the construction of Plastiki and, in fact, the entire vessel could be recycled post-voyage and transformed into computer casings, for example.